So I'm still back-tracking all the different DC Universe Animated Movies that I've watched over the years and adding them to the Geeky Guide accordingly. There's a weird gap where I wasn't all that consistent with posting reviews for them despite having seen them all. But I have to admit, a lot of the older ones were a lot better than many of the more recent releases. 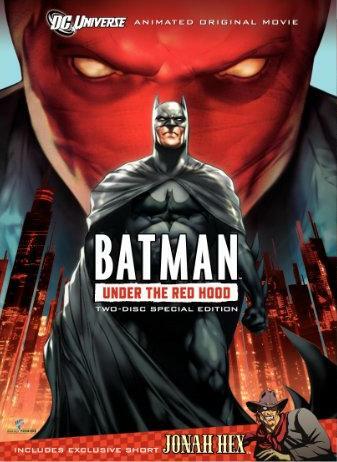 Batman: Under the Red Hood was one of the many direct-to-video movies that seemed to make an effort to follow fairly recent comic book stories. Admittedly I've had rather mixed feelings about this since I haven't been all that enthusiastic about the direction the main comics have taken, including the Batman family. But to be fair, this story - whether from the comics or as an animated movie, wasn't all that bad. So things really boiled down to actual execution and how they brought the Batman to life. And this also marks another Batman feature that seemed to experiment with voice talents for many of the iconic roles. Synopsis: Batman: Under the Red Hood is a 2010 direct-to-video animated movie directed by Brandon Vietti with a screenplay by Judd Winick. The story is based around the comic book stories "A Death in the Family" and "Under the Hood". The movie starts with the rather traumatic event of the death of the second Robin, Jason Todd (Jensen Ackles). With Ra's al Ghul (Jason Isaacs) having allied himself with the Joker (John DiMaggio), things were grim indeed with the Batman (Bruce Greenwood) racing to save his protege but being too late in the end. Beaten nearly to death with a crowbar by the Joker, Jason Todd was able to escape the trapped warehouse that the Joker had also rigged to explode. Five years later, a new criminal known as the Red Hood moves into Gotham and starts to take command of the drug trade in the city. Quite arrogantly so, the Red Hood offers the drug lords protection from both the Batman and the crime boss known as the Black Mask but at the same time he also promises greater profits. Elsewhere, Batman and Nightwing (Neil Patrick Harris) intercept a stolen truck that appears to contain the components for Amazo, the killer robot. Once again the heist seems to have connections to this new Red Hood and Batman has to figure out who is behind the mask before it's too late. Now I admit that I was rather surprised that they decided to tackle "A Death in the Family" at all. It's a rather key moment in Batman history and also one that was quite brutal. And it was great that the movie didn't water things down to be more child-friendly. The story remained to be as mature as it needed to be and yet still tasteful in its presentation. And believe me, it isn't at all easy to think of a way to "tastefully" present the brutal murder of a teenager. The differences in voices were a slight quirk, but not exactly a deal-breaker. I always bring this up when Kevin Conroy doesn't voice Batman himself for obvious reasons. But I have to admit that we can't remained tied solely to Conroy. And Greenwood wasn't too bad. And I didn't even realize that it was Neil Patrick Harris voicing Nightwing right off the bat. His performance worked for the role and the overall tone of things. I never quite put a voice to Jason Todd in terms of all my reading, so I guess I was pretty open to taking Jensen Ackles easily enough. He wasn't exactly great though, but he got the job done I suppose. There were moments that he actually seemed a little pitchy even as Red Hood, but one just has to accept how much of a whiner Jason Todd was. But talking about the opening sequence and the voice acting are all second to the story itself. And while I wasn't necessarily a huge fan of the return of Jason Todd in the comics, the story was tight enough in this movie that the whole thing generally worked. I can understand why this animated movie became quite popular among different fans. The aspects of the story that they lifted and brought together for this movie resulted in a nicely solid story. The quality of the animation was just gravy on the side, really. It all nicely complicated the story and the action was well depicted on screen. If only more DC movies were this good - there's nothing wrong with being faithful to the source material people! Batman: Under the Red Hood is a good little addition to any Batman collector's home video collection. In fact, I think this one could have done decently at the box office had they decided to take the risk. So the movie rates a great 4 Jason Todd flashbacks out of a possible 5.